A few days ago, Zynga started rolling out a new goal series in Pioneer Trail that sees Bess' horse Ember giving birth to a Colt that can be grown into a strong riding horse. For whatever reason, the rollout for this feature has been incredibly lengthy, and some users are just now getting their hands on this set of goals. There are only four goals to complete here, and they even introduce a new (but contradictory) romance to the game. Let's get started. Nutritious Tonics are a new crafting project that can be crafted after you place Ember on your Homestead. She'll appear as an injured animal, with a meter above her head (that represents her progress towards giving birth), and by simply clicking on her, you'll see her "Crafting Workbench." Yes, an animal has a crafting workbench - just go with it. The Nutritious Tonics take one Bitter Solution and four Mustang Marmalade each to craft, will Bitter Solutions themselves being a crafting project. 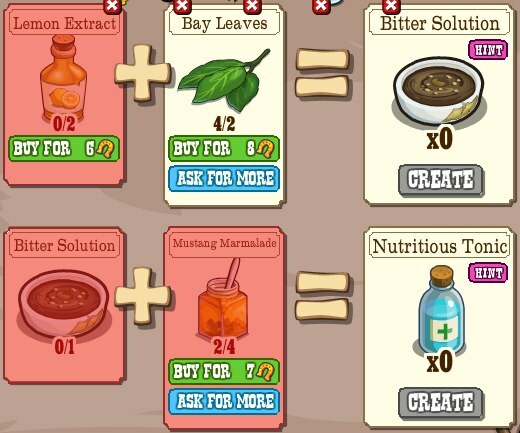 You'll need to ask your friends for the Mustang Marmalade through individual requests, while the Bitter Solution is created using two Lemon Extra (tend Lemon Trees) and two Bay Leaves each. Bay Leaves are earned through a general news post. For finishing this first goal, you'll receive 250 XP, 250 coins and a Horse Ready Boost. You'll need to continue tending to Ember until she eventually gives birth to the baby Colt. This Colt can also be placed on your Homestead as another injured critter-inspired animal, and you'll need to "heal" it later on. For now, just ask your friends for the Wikiwah Blankets and tend all of the horses on your Homestead to at least finish part of the second task. When you finish this entire goal, you'll receive 350 XP, 325 coins and Ember herself. The Wikiwah Medicine is another crafting project, requiring two Horsebreath Soup and two Nutritious Tonics to craft a single one. The Horsebreath Soups come from four Apricot Powders and three Garlic Yogurts (ask your friends) each. Cabbage, meanwhile, takes 16 hours to grow. Once you finish this one (unfortunately, it seems pretty time consuming), you'll receive 550 XP, 425 coins and the Baby Colt itself. Cotton takes three days to grow, giving you plenty of time to collect the 45 other items needed. As you make it to this point in the goal series, you'll see Bess and Thunder taking a liking to one another, to the point that you're greeted with a pop-up at the end of this event telling of "Moonstruck lovers riding out without a care." Is this just me thinking too greatly into this again, or was Bess not supposed to be with Flintlock? Ah well, change is inevitable, and we're definitely seeing that here. For finishing this entire goal series, you'll receive 400 XP, a Picture Frame and a Cowgirl Doll. What do you think of this goal series in Pioneer Trail? Are you happy to see Bess riding off with Thunder, or do you think she was better off with Flintlock? Do you even care about the story and romances in Pioneer Trail, or do you pay little attention to it? Sound off in the comments.